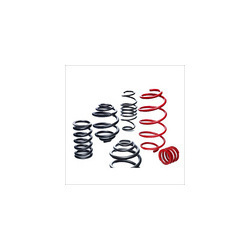 Our range of products include automobile helical compression springs, coil springs, industrial suspension spring, automobile metal springs and suspension springs. We offer an extensive range of Automobile Helical Compression Springs which is available the Load bearing capacity upto 40tons per pc. These are manufactured using round wire wrapped in cylindrical shape with a constant pitch between the coils and is known for its heavy load bearing capacity. Our products are provided with the material section of various types such as round, square, rectangular taper, flat and many more. 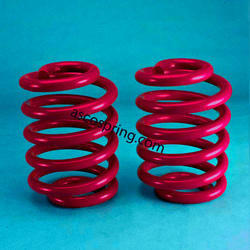 Asco Spring produce the world's largest range of automotive Coil springs good qualitity and heavy duty applications. Asco manufactured in India using modern, state of the art production methods, Asco maintain 100% quality control over every spring in the range. We are committed to ensuring excellent quality & high value products across the entire range. Asco take pleasure to introduce ourselves as one of the prominent manufacturer, exporter and supplier of Suspension Spring. The offered Suspension spring is manufactured using optimum quality material in fulfillment with the market norms. Offered suspension spring is used as in-vibrators in elevators. This Suspension spring is available in various sizes to fulfill the ample need of clients. We are engaged in manufacturing an enduring range of Automobile Springs, employing the best quality raw materials procured from our reliable sources. 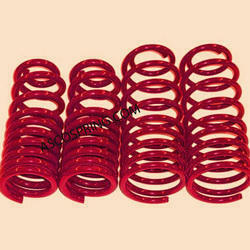 We are a distinctive Automobile Spring Manufacturer, Suspension Spring Supplier and Exporter of the industry. 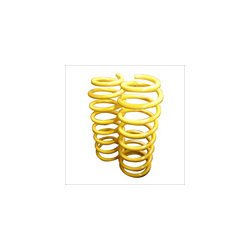 Our wide assortment of springs renders long working life, great performance and multiple applications. Our skillful professionals devote their vast knowledge and thorough research in developing these springs as per varied market guidelines. These are available in varying grades and specifications in accordance with client's specifications. We also provide Automobile Suspension Springs, designed to provide better holding grip and increased safety. They ensures product's firmness and safety and prevent the object from swaying or bending while in the process. We are a Trusted Suspension Spring Supplier Of India, supplying to our world wide spread customers. These are produced utilizing high grade raw materials as per the growing requirements of the industry, offering a prolonged service life. Our superior quality springs are an outcome of state of the art manufacturing unit, equipped with the latest technology, under the extreme vigilance of professional team. These springs can bear a million compressing and stretching, owing to their detailed construction. These are free from rust and any mechanical damage, which weakens the springs. We own a capacity to render any size or design of springs, which are thus offered at industry regulated prices. Chrome - Vanadium Steel BS: 970/55 En-47, IS:3195 Gr.50Cr4V2 and Gr.60Cr4V2, IS:5160, Sup-9 and SAE-4161H. Status of Finish: Shot peened, if required. Shot peening operation is followed as per IS:7001 to improve the fatigue life of spring. Looking for Automotive Springs ?